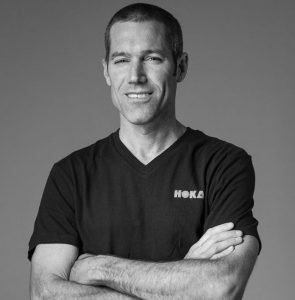 Meet Dave Mackey – endurance athlete, father, husband, physician assistant, and ultrarunning legend. Dave is an extraordinary person who has been through an extraordinary event that changed his life but it didn’t change who he is. Many years ago he discovered the soul-freeing nature of trail running and he became really REALLY good at it. Dave has set course records at many ultra-distance trail running races, including wins at the Montrail Cup, USATF national trail running titles at 50k, 50mile and 100k as well as being a former record-holder of the Rim to Rim to Rim among other incredible accolades. 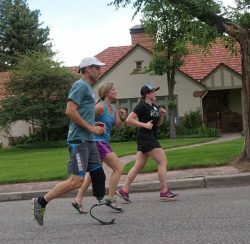 Dave’s life as an elite ultrarunner all changed on May 23, 2015 when he stepped on a loose rock during a training run he had done countless times before on Bear Peak in Boulder. As he fell, he landed on his back and literally watched a massive rock tumble down and crush his leg. 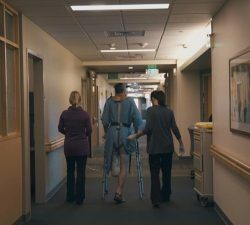 One year later and after many failed surgeries, Dave made the decision to have his lower leg amputated. Today he is exploring the same hiking trails near his fall on a cold, sleety day in October, almost exactly one year from the day of his amputation – with a prosthetic leg. Dave is also my neighbor. I housesit their creatures. Our kids run in similar circles. So I see Dave and his family all the time and I have to reiterate that Dave is a really normal guy – or as normal as our crazy ultrarunning friends can be! This accident hasn’t changed him in any obvious ways except that he carries a little less skin and bone. Dave has been through an extraordinary event and been faced with making decisions at a level that most of us will not, and he has come out swinging. We did this episode in two parts because we both place an emphasis on picking our kids up from school on time! Hey there, aren’t you glad we didn’t get into a political discussion or some sort of diatribe about performance enhancing drugs? If you google Dave Mackey, you’ll find some podcasts where he was pressed on these topics, but that’s not what my podcast is all about. It’s about finding inspiration through each other’s journeys so that we can feel just a little bit less alone in the world. As you can tell, Dave is very practical but he is still able to dig deep on the big topics. His is the kind of mentality that wins races. Think about when he said, “Accidents happen. All you can do is try to make the best of it.” And in the end, it can always be worse. When someone who made the decision to amputate his own leg says that it can always be worse, we need to stop, listen, and embrace. On that note, let’s wrap it up. Don’t forget to go over the Skirt Sports FB page entry from Fri, Nov 3 and tell us what you would write on your leg is you knew you were going to lose it. All right everyone. You know what time it is. It’s time to get out there and run this world. Have a great workout and I’ll see you next week.